Mira Sushi and Izakaya recently opened with some serious pedigree in the kitchen. I’m talking Nobu 57 and Telepan. 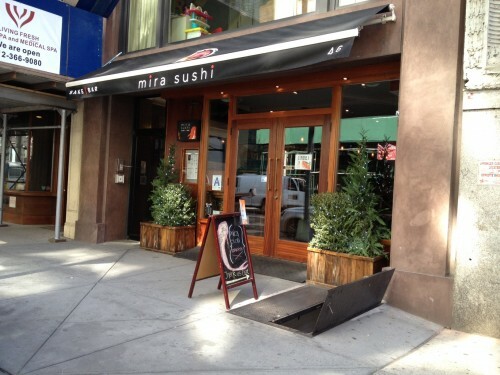 Given the high-end Asian restaurants Hanjan and Sen that recently opened in the Flatiron area (which are all just or way out of ML budget) I was curious where Mira would fall. 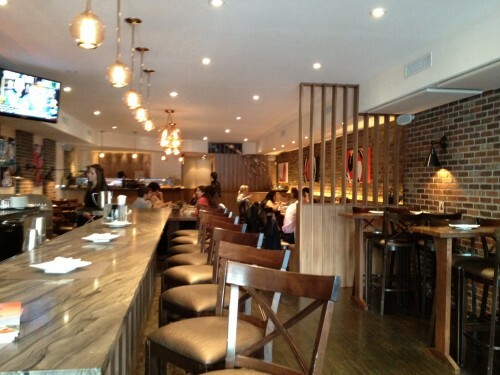 I wasn’t blown away by the interior, which features the bar area up front and the sushi bar in the back. The bar area does have some nice large high tables which could be nice, especially after work with some drinks and some friends. We’ll occasionally gets email tips and notifications from restaurants or readers about openings or new menu items. To be prepared, I printed out the lunch menu emailed from Mira and placed my order accordingly. I tried to order one standard item (maki roll combo ($8.95 plus 50cents for crunch on a roll) and one item of interest (jap chae with beef ($9.95). Imagine my disgust and shock when I went to pull up the online menu to provide a link for you all, and I saw things like Kyoto crunchy sloppy joe ($9) and pork and rice cake skillet ($10). !!!! I mean…I feel like I was tricked, and I failed you all. I’m sorry. Before you keep reading, it would be best to think of this as a partial first look. Considering I didn’t try the two most exciting items on the menu, no way to take this as a full write up. 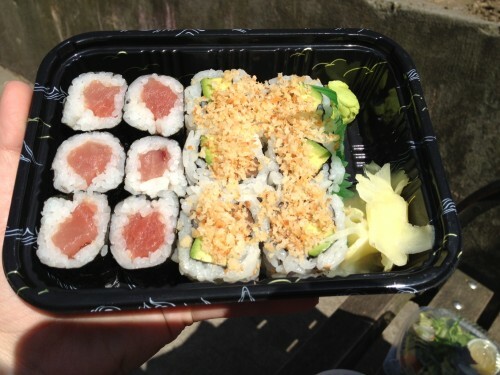 I got miso soup, tuna roll and salmon and avocado roll with my maki roll combo. I find that miso soup at Japanese restaurants tend to live in a range of good to slightly better. 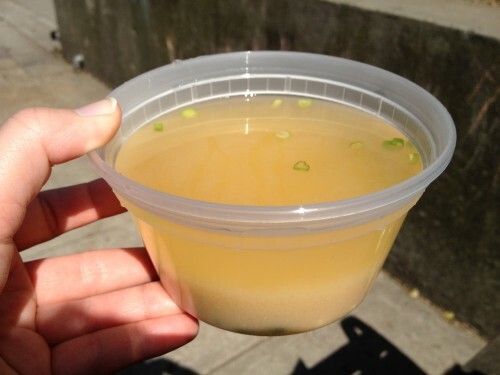 I don’t think I have ever had a bad miso soup, but I also haven’t an amazing one either. This one was on the better end of the miso soup continuum. The tuna roll and salmon/avocado roll were both standard. Nothing notable to add. The jap chae with beef was a little bit more memorable with big pieces of mushrooms, carrots, onions and greens. About half the beef had a sear on it. There was a nice thin layer of sesame oil. 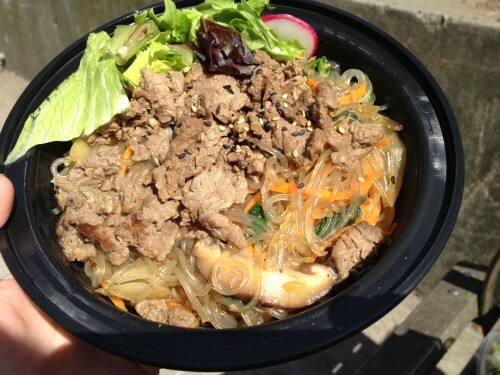 With my jap chae lunch special, I was also given the option of miso soup or salad. Given I had already ordered the miso soup, I tried the salad with this dish. 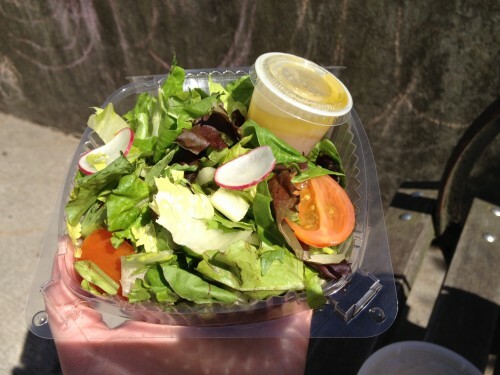 The salad was good, but again nothing too special. Of the lunch options I tried, it seems to me that they are meant to satisfy a generic “working lunch” crowd. And it does that very very well. If you already order sushi or noodles for lunch, you should add Mira to your rotation. If you are like me and were hoping for a new angle on Japanese or Asian food, please venture further on the menu than I did. Mira will be my new to-go for basic sushi combo. Mira has a nice mix of basics with exciting new dishes. Mira has a relaxing atmosphere for a relaxing lunch. The sushi combos here are totally average. I dislike when restaurants try to cover more than one Asian cuisine. They should stick with one. Mira seems to price me out of the some of the more interesting options. Posted by Sarah Zilinski at 9:00 am, April 19th, 2013 under Flatiron Lunch. your first mistake is this place is NOT japanese. And it’s not an Izakaya. and the only thing pedigreed about Nobu57 and Telepan are the prices and lack of taste buds of their poseur clientele.